Google Business is essentially a free blog site for you to grow traffic and engagement. It is reasonably simple to sync with your website, download the Business Google App to get started, follow the directions for set-up and make your first post! Pro-Tip #1: Post a photo with 1-3 sentences of relevant text about the picture and your business as frequently as you post to either your FaceBook page or Instagram. An easy way to do this is copy your text from your Instagram post before you publish it. Load the same picture in to Google Business as an update, paste the text and publish your update. This takes less than 1 minute and doubles the impact of your Insta or FB post. Why do this? Your images will show up in Google search. 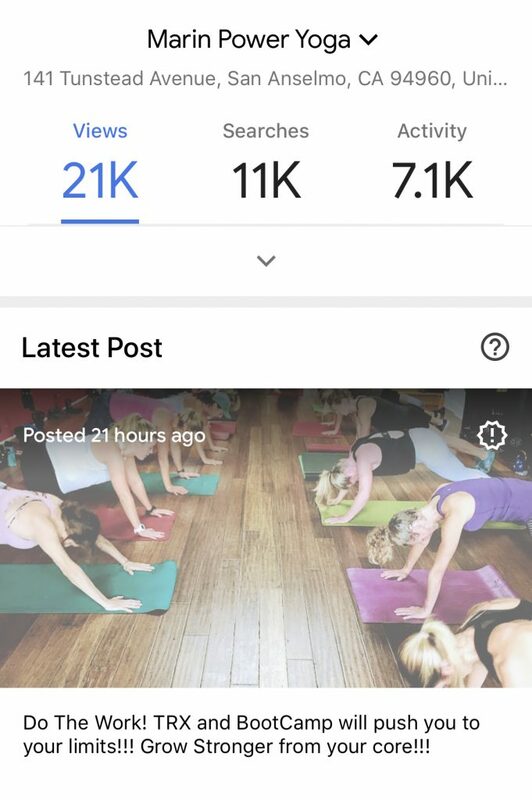 Look at the screen shot from Marin Power Yoga, notice their images are viewed 389% more than similar businesses. Why? Because content is posted regularly to Google Business. Yes, better pictures are viewed more. Does that mean wait until you have professional photos to post? No, the mobile app is easy to use, start taking and sharing your photos regularly. Pro Tip #2: Use Relevant Text. What are your keywords and how should you use them? Short clear sentences, with words that people will associate with in the image and in your business. In this screen shot you can see how much Marin Power Yoga was found in search and the latest post underneath. This planking image from a class includes the words BootCamp and TRX making it easier for people searching for those classes to find location relevant information. Keep it clean and simple, don’t over think what to post, this is an area to execute a process. ProTip #3: When To Do This. Regularly. If you are posting content to your Blog, Pinterest, Instagram, FB, Reddit, Twitter (people still use this? ), LinkedIn, YouTube or any other niche social platform…your content should be making it onto Google Business. Generally, we all use the same excuse for things that feel burdensome or we don’t understand, “I don’t have time to do that.” Posting to Google Business takes 1 minute on your phone, you can do this while you are sitting on the toilet or watching the news. How long will this take to work? People, this is a marathon, not a sprint. Be consistent and watch your numbers steadily grow each month. Use your iPhone like the incredible content creating super computer it is. Take Photos and Videos with your phone and share them across your social platforms and on Google Business. Wait. Did you catch that? Videos. 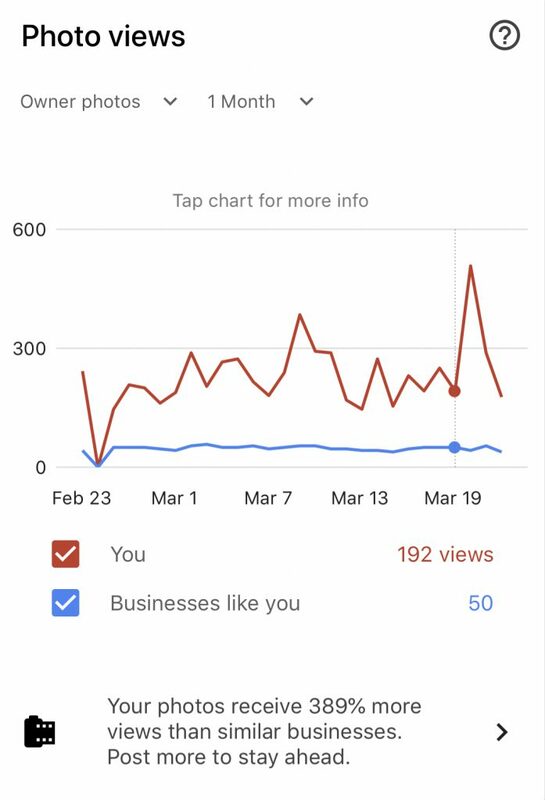 Yes, Google Business started letting you upload videos in 2018. Everybody, including LinkedIn wants your video content. You want more engagement, upload videos regularly (this is harder than photos for many reasons including skill in creating content, bandwidth and quality of content). All of the social platforms are favoring video in their newsfeed algorithms. Why? They want you engaged for longer periods of time on their platform. 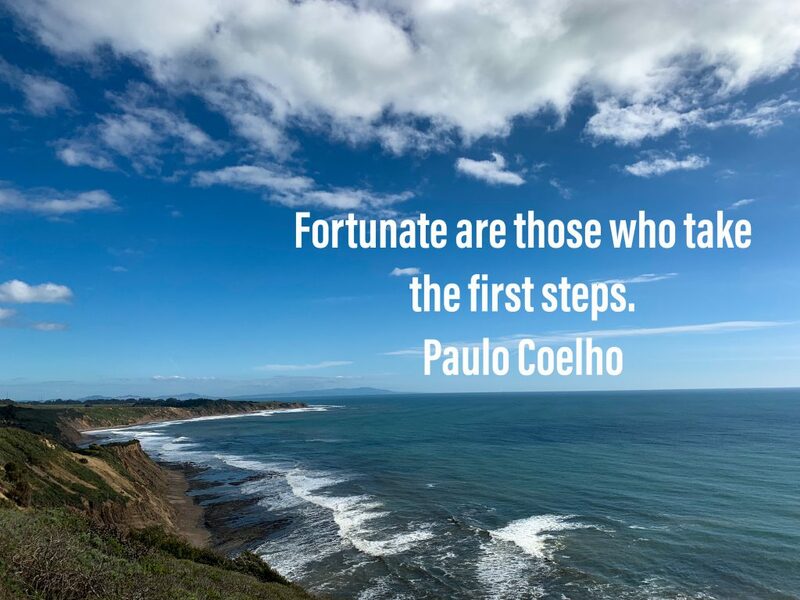 Why use this Paulo Coelho quote? Because each time we try something new we break past fear and embrace our vulnerability, we become stronger and smarter. Take the first few steps to improving your Search Engine Optimization and driving qualified business to your website. Jamie Ginsberg, Proudly powered by WordPress.